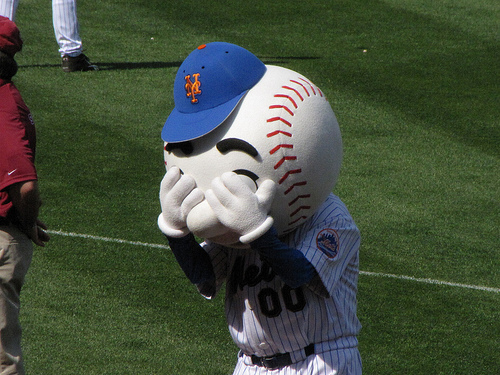 THE METS WERE PRAYING FOR ME! Today would have been my Dad’s 83rd Birthday! It was because of him that I became the passionate Baseball and New York Mets Fan that I am today. It seems only appropriate then that I should share such an amazing story as I remember such a wonderful man! He graduated to Heaven back in 2000, but I still miss him every day and dream of him every night! This tale gets to be told all because of the kindness and thoughtfulness of one of my Friends from my Philadelphia College of Bible Days named Ginny McDonald Tadrzynski. On Friday, April 17th, she mailed a package to me that included a New York Mets Cap signed by Mets Shortstop Wilmer Flores, Mets Outfielder Kirk Nieuwenhuis and former Omaha Royals Player and current Mets Coach Tom Goodwin. It also included a Mets Spring Training Yearbook from Port St. Luce, Florida. I was so moved by this act of thoughtfulness and was very appreciative and that is even before Ginny told me the whole story behind it all. This is where it gets almost miraculous! I’ll let Ginny tell it in her own words! “Okay, here’s the deal. We have been studying Esther in the Ladies Bible Study I go to and today’s emphasis was on Esther Chapter 4 and verse 14 which says, “For if you remain silent at this time, relief and deliverance for the Jews will arise from another place, but you and your father’s family will perish. And who knows but that you have come to your royal position for such a time as this?” Mostly dwelling on the ‘such a time as this’ as God has His timing and who are we to question it? We also went further in the book and studied about where Haman knew his goose was cooked and the guards showed up to ‘help him get to Esther’s banquet’ before he could cause any more chaos- which again was also clearly pointing to God’s perfect timing. Well, this whole Bible Study has been a ‘just a time as this’ for me. God’s timing is everything. In the beginning of our Study together, we always have a time of prayer requests, and since I drive a school bus, I offered prayer of gratitude that the snow storm on 2/24/15 missed us, but added that you, dear soul, and I named you by name, would be over the moon as Cape May got 8″ of snow that day and the only thing you loved more than snow was God, your family and the New York Mets. That sentence was met with a hearty chuckle from the other ladies in the room and that is when something else happened. Remember when I said on your birthday that patience is a virtue and I had something up my sleeve? Well, it fell out of my sleeve today. After Ginny finished writing this unbelievable occurrence of events to me, I had tears pouring out of my eyes because after these last six months of physical hell that I have been going through- what a fresh breeze from Heaven this turned out to be. God has a way of making us smile and reminding us that His love is personal and unique to each and every one of us and He pours these unexpected packages upon us just when we need them the most! After all the years that I have prayed for the Mets- I can actually say honestly and truthfully- My Mets have been praying for me and a million dollars wouldn’t have been received any better than this surprise orchestrated from above! Thanks Ginny! Thanks Mets! Thanks God! Now the Mets are off to their best start in years and I am feeling better than I have been in months and maybe the times they are a changing but though it all- God always gives us just what we need at just the right time! For such a time as this! And there couldn’t have been a better time than now! Happy Birthday Dad! Keep saving me a place because someday I will be crossing Home Plate to join you- but not yet! I feel like I have a few more hits left in this old body of mine! Play ball!